Overview - After the release of Jake Blues from prison, he and brother Elwood go to visit the orphanage where they were raised by nuns. They learn that the church stopped its support and will sell the place unless the tax on the property is paid within 11 days. The brothers decide to raise the money by putting their blues band back together and staging a big gig. They may be on a "mission from God" but they're making enemies everywhere they go. Special Features: Stories Behind the Making of The Blues Brothers: Go behind the scenes with Director John Landis, Dan Aykroyd and the Blues Brothers band. Transposing the Music: Highlights of the many spin-offs, tributes and merchandising developments, as well as stage shows, impersonators and pop culture inspired by the film. They're on a mission from God, and nothing -- not the police, a disgruntled country band, some Illinois Nazis, or even a jilted, rocket launching ex-lover -- is going to stop them from spreading the gospel of rhythm and blues. Since the golden age of Hollywood, music and comedy have been tangled together in an exuberant dance of laughs and melodies, and with the 'The Blues Brothers,' director John Landis defies and reinvigorates the conventions of the classic musical comedy, in a soul thumping, toe tapping ride of mayhem and song. Though over thirty years old, the jokes still feel fresh, and the music is as timeless as ever. 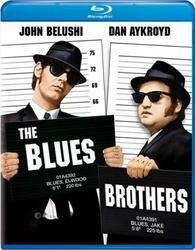 Based on the stars' original 'Saturday Night Live' characters, Jake (John Belushi) and Elwood (Dan Aykroyd) are two blues performing brothers who embark on a holy mission to put their band back together. Their noble goal is to raise enough money from gigs to save the orphanage they grew up in. Along the way they encounter various obstacles and gradually gather an eclectic mix of pursuing enemies, all while taking numerous detours into some great musical performances. The script is a fun mixture of dry and larger-than-life comedy, as well as action packed set pieces. Really though, the plot is just a loose excuse for some wisecracking, car crashes, and various R&B numbers by some of the genre's most famous performers. And really, there's nothing wrong with that. Despite the somewhat thin story, Landis and Aykroyd have crafted a wonderfully creative universe, that juxtaposes exaggerated, almost cartoonish conflicts and happenings with straightforward reactions. Impossible maneuvers, explosions, and car crashes fill the film with a great sense of excitement and childlike playfulness, but the characters appear almost oblivious or even dismissive of the insanity around them, leading to a slightly absurdist sense of humor. 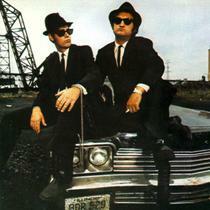 Aykroyd and Belushi are both fantastic in their iconic, sunglass-clad roles. They play off of each other brilliantly and their deadpan deliveries and responses clash perfectly with the outlandish events they find themselves in. The movie is home to some truly memorable sequences (the early "ruler" scene being a great example) and endlessly quotable dialogue and both performers add a lovable and endearing quality to it all. From a purely musical standpoint, Aykroyd and Belushi both hold their own very well, even among such legendary company, bringing an energy and style that is uniquely theirs. Landis seems almost like a kid in a candy store here, utilizing the large budget he had to work with to its full extent, by littering the proceedings with action packed hilarity. The car chases in this film are among the most impressive ever put to celluloid. The sense of speed that the director creates with his shots and camera angles is amazing, creating a spirited and kinetic experience. The shopping mall police chase and the film's famous climax of vehicular destruction are truly incredible feats of no-holds-barred moviemaking, and somehow the mayhem all fits wonderfully with both the comedic and musical aspects of the picture. Like actor Henry Gibson points out in the special features, the car chases are actually stylistic extensions of the musical numbers, and the cars themselves aren't just crashing, skidding, and exploding -- they're dancing. The supporting cast of musicians all do a great job, though some of their acting can be a little suspect. This isn't much of an issue though, and the actual musical performances are the real highlight of the film. Some of R&B's greatest icons make appearances, including Aretha Franklin, Ray Charles, James Brown, and Cab Calloway, and they all light up the screen with class and high energy. Landis injects some fun choreography and bits of humor into these numbers, and seeing the brothers and their band, as well as the various, famous performers doing what they do best, is a real treat. 'The Blues Brothers' is a truly unique and funny film, whose creative mishmash of sensibilities and genres has yet to be successfully emulated. Belushi and Aykroyd create enduring, iconic characters and Landis brings all the colliding ideas into a mostly cohesive, but still intentionally manic car crash of melodic, cartoonish antics and deadpan sincerity. Sure, the plot is a little happenstance, and real character development is essentially nonexistent, but there is no denying the lasting impact of the film, making this a comedy classic that continues to entertain. It's got great humor, crazy car chases, and sensational music, and really, what more could one want? Universal brings 'The Blues Brothers' to Blu-ray on a single BD-50 disc housed in a standard case. Both the original 133 minute theatrical cut and a 148 minute extended cut are included. The additions made to the extended version are negligible, with some slightly extended musical numbers and an odd scene or shot here and there. The new footage is easy to spot when watching the film, as differences in the source elements have led to visual inconsistencies (more on that later in the video section). Some skippable trailers play upon startup before transitioning to a standard motion menu. The movie is provided with a 1080p/AVC transfer in the 1.85:1 aspect ratio. While the film looks pretty respectable, the transfer is still a little inconsistent. Both cuts of the film are provided on the same disc. A disclaimer runs before the extended cut which explains that the video was taken from a different source than the theatrical version, causing some variations in appearance between the two edits. For the most part, both exhibit the same strengths and weaknesses, with the exception of the additional scenes themselves, which look quite different from the rest of the presentation. Below I'll assess the bulk of the transfer and then discuss the specific issues involved with the extended scenes. The print is in good shape with no major signs of age or damage. Grain is usually visible but doesn't always look completely natural, and there may be some slight, but not excessive digital manipulation, with minor signs of sporadic edge enhancement and video noise. Detail is good, but many shots have a soft, flat look to them. Colors vary from fairly muted to pleasingly vibrant, with some scenes displaying a nice pop. Sequences set at night, with the flashing lights of Chicago shinning in the background, tend to show the most depth. Black levels are consistently deep and contrast is good without being blown out. More problematic is the extended cut, which features several shots and sequences that vary drastically from the normal look of the film. These inconsistencies appear to be isolated to the newly inserted scenes and exhibit an overexposed and washed out appearance. The new footage doesn't match at all with the old, and what's worse is that some additions come right in the middle of original scenes, making certain shots stick out like sore thumbs. While it's nice to have the option to watch the extended cut, the inconsistent appearance of the new material makes for a distracting viewing experience. The video transfer isn't bad by any means, and appears to reflect the filmmaker's original photography well, but some softness and conflicting footage (in the extended cut) lead to a solid but not impressive presentation. Both cuts of the film are presented with a standard English DTS 5.1 soundtrack. Yes, you read that right. Just regular old DTS. I'm a bit perplexed too. Space limitations caused by the dual video transfers and long running times may have been a factor, but regardless of the reasons, the exclusion of a lossless track is extremely disappointing. Despite this major technical letdown, the fact of the matter is, even in standard DTS form, 'The Blues Brothers' sounds great. Dialogue is clean and full sounding. Directionality is frequent and surround use is lively and creative. Squealing tires, crashing cars, whizzing bullets, and breaking beer bottles boom from all around the soundstage in a pleasingly immersive experience. The musical numbers themselves sound fantastic, with deep fidelity and great range. Bass has some nice kick in the action scenes and performances but never quite reaches the level of room shaking power. Balance between elements is handled well but the pre-recorded music numbers seem to have been mixed a bit higher than the rest of the film, making transitions to these scenes a little jarring. While Universal's decision to deprive fans of a lossless audio presentation is frustrating, this DTS track still holds its own quite well. A French DTS 2.0 track is also included along with English SDH, Spanish, and French subtitle options. Universal has provided a decent collection of supplements, including some in depth featurettes. All of the extras are presented in standard definition with DTS 2.0 audio and optional English SDH, French, and Spanish subtitles, unless noted otherwise. Stories Behind the Making of The Blues Brothers (SD, 56 min) - Available to view as one extended doc or fourteen separate featurettes, this an interesting look back at the film, that includes interviews with the cast and crew, and behind-the-scenes footage. It is also, inexplicably, presented in DTS-HD Master Audio 2.0 sound. Yes, you have once again read that right. This standard definition supplement gets lossless audio, but not the main feature. Clearly Universal is intentionally toying with us now. Counter-intuitive sound choices notwithstanding, this is a solid supplement. Director John Landis, star Dan Aykroyd, and various members of the band, trace the conception of the movie from its 'SNL' roots to its eventual big budget presentation. The participants all offer some great bits of entertaining trivia, including details on Aykroyd's epic 324 page first draft of the script, several crazy stories about the late John Belushi, and the fact that many of the legendary musicians featured in the movie had a hard time lip syncing their own songs. Fans of the film will definitely want to check this out. Transposing the Music (SD, 15 min) - More interviews about the formation of the characters and music are included, with some repeated stories and information. Some new bits include further talk of the film's lasting appeal and influence. If you've watched the previous doc, this is mostly redundant. Remembering John (SD, 10 min) - The focus here is on remembering the late, great John Belushi with more interviews with the cast and crew as well as his widow. There are again some repeated stories, but this is a decent tribute to the comedian. Theatrical Trailer - The theatrical trailer is included in standard definition. 'The Blues Brothers' is a singular comedic accomplishment, one that somehow blends cartoonish action, deadpan humor, and classic blues music into a fun and entertaining package. The video is good but has some issues, and while not lossless, the audio is strong. Supplements are informative but a little redundant. While some disappointing but relatively minor technical problems, and a perplexing audio choice -- a lossless track on the supplements but not the main feature, really?! -- do prevent this disc from being a total home-run, Universal has still done a respectful job with this great movie. Definitely recommended.